An Egyptian MP has withdrawn a draft law to ban women wearing the niqab in public places after the proposal sparked a wave of anger. Ghada Agamy said the face veil had become a source of sedition in Egyptian society when she introduced the plan last week. 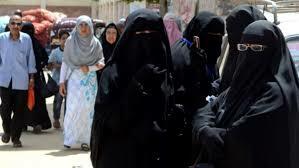 The draft law proposed that all women would be prohibited from wearing the niqab in public places. She suggested a fine of 1,000 Egyptian pounds ($56) for those who broke the ban and the fine should double as the act was repeated. “Niqab aims to change the moderate character of Islam in Egypt and reflects the extremist ideology of Salafist movements, not to mention that it has split society into those with niqab and those without,” Agamy said. But on Thursday she withdrew the draft law saying that she did not want to create a rift in Egyptian society and that the purpose was to confront the crimes using the niqab. The MP floated the idea last month after Algeria introduced a niqab ban in the workplace. But many MPs and Egyptians rejected theidea, saying it violated individual freedoms, and that it may lead to further strife in the country, which became politically divided after the Arab Spring uprising in 2011. Engineer Sally Ahmed, a Cairo resident, said no one has the right to ban the niqab. But MP Mohamed Abu Hamed suggested the government should issue a decision to ban the niqab for employees in government agencies, similar to Algeria. However, he admitted the draft law included articles against public freedoms and violated Egypt’s constitution. “We have two Islamic countries, Tunisia and Algeria, that have imposed a ban on the niqab in public places, not to mention that France currently has the same ban,” said Abu Hamed. “Several militant movements have used women wearing niqabs to carry out terrorist acts, kidnap children or assassinate public figures,” Abu Hamed said. The UN Human Right Committee said last month that France’s 2010 niqab ban violated the rights of two women who were fined for wearing full-face veils in public. Help keep Expat Cairo independent. If you value our services any contribution towards our costs would be greatly appreciated.